Not sure where you lie in the great wilderness that is the Internet? Wondering how far away your friends (or enemies) are along the TCP/IP pipes? 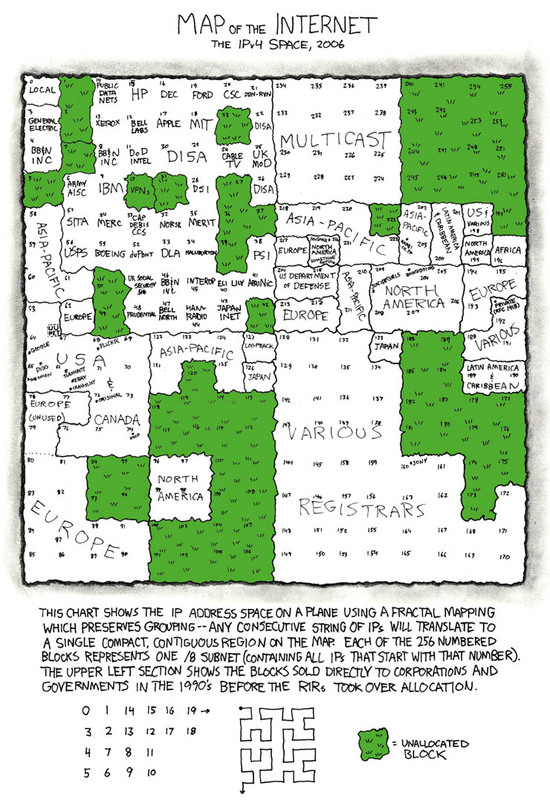 Look no further — just use the Map of the Internet! The Examiner: Robert Cox: When will the right recognize the cost of conceding Web 2.0? "Refugee who Fled Iran's Mullahs Becomes First Woman Space Tourist"
stars and dream of joining them in the blackness of space. Yesterday, a week after her 40th birthday, she made her dream come true. from Star City in Kazakhstan. University in Virginia and George Washington University in Washington. networks, just as the industry in America was deregulating. reusable spacecraft into space twice in two weeks. The Ansari X Prize was claimed in 2004 by Mojave Aerospace Ventures. matter of time before Mrs Ansari signed up. most of which goes to the Russians. and the American , Jeffrey Williams, on September 29.
again from high above Earth. She has not been back since she left. explorers at Earth’s final frontier. Enter Your Name and see what happens. supporters in case they want to order prints as well. "I’m Mad as Hell and I’m Not Gonna Take It Anymore"
Immigration Solution: Do as Mexico Does, Ha! Mad as Hell and I’m Not Gonna Take it Anymore!” coalition. in Los Angeles, New York and elsewhere in recent days. Equal Employment rights are denied to immigrants, even legal ones. arrest illegal aliens and hand them over to police for prosecution. Imagine the Minutemen exercising such a right! immigrants -- may be expelled for any reason and without due process. counterparts south of the border. They should adopt the same laws." Did Jesus Walk on Water? Or Ice? have had frozen patches in Jesus' day"
: said to have walked on water, a scientist reported Tuesday. : springs that empty into it. : related to Jesus have been found. : that region only a handful of times during the last 12,000 years,"
: said Doron Nof, a Florida State University professor of oceanography. : explains the biblical account." : ice” may have formed once every 30 to 60 years. : spot, especially if rain had smoothed its surface. : Israel is effectively zero, or about once in more than 10,000 years,"
Click for printable version, which can be sent to your Congressman, Senator, etc. who refuse to pass legislation to stop illegal immigration and fix the legal immigration process. Just remember that you are not a politician, so don't try to spend this fake money. Controversy over the publication of images depicting Mohammed in the Danish newspaper Jyllands-Posten has erupted into an international furor. While Muslims worldwide are calling for a boycott of Denmark and any other nation whose press reprints the cartoons, Europeans are trying to stand up for Western principles of freedom of speech and not cave in to self-censorship in the name of multiculturalism and fear. While the debate rages, an important point has been overlooked: despite the Islamic prohibition against depicting Mohammed under any circumstances, hundreds of paintings, drawings and other images of Mohammed have been created over the centuries, with nary a word of complaint from the Muslim world. 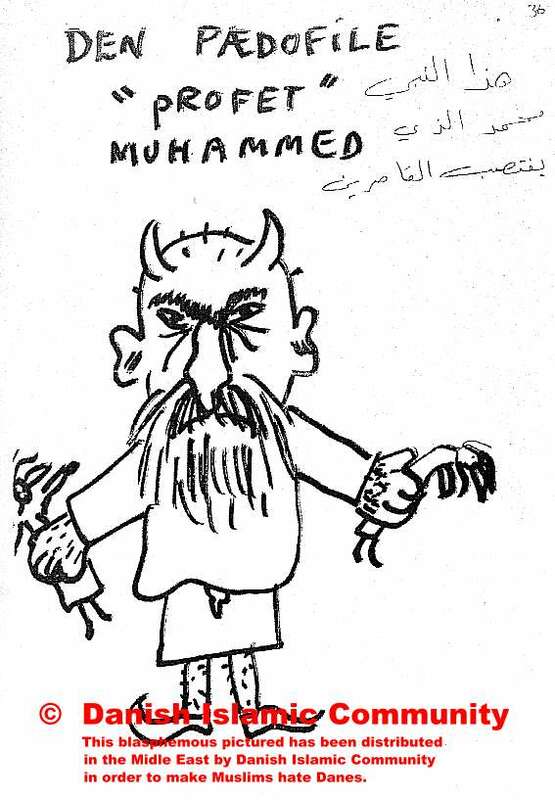 The recent cartoons in Jyllands-Posten are nothing new; it's just that no other images of Mohammed have ever been so widely publicized. The Danish newspaper, EkstraBladet, has obtained a copy of the secret case file, which Islamisk Trossamfund (Danish Islamic Community) has distributed on their "road show" in the Middle East: (Viste pædofil Muhamed - the text is in Danish but the article links to all 43 images). It turns out that the 12 drawings in JyllandsPosten weren't sufficiently bad - at least not to justify a trip to the Middle East - so the imams have inserted a few extra images to make sure their trip wasn't a waste of money. 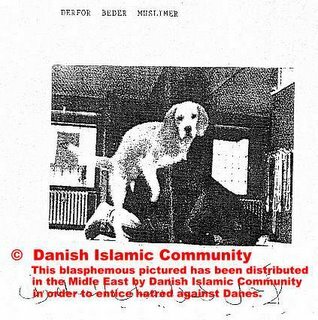 Danish Islamic Community claim they have received these images in mail, but they refuse to tell Danish newspapers, who has received them - and they won't allow the newspapers to interview these people. Danish Islamic Community has also failed to explain, why an entire country must be denigrated all over the Middle East because of 3 drawings mailed by a single person. 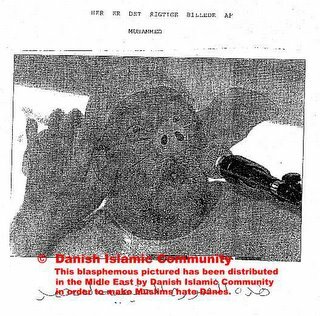 As long as Danish Islamic Community have failed to properly explain, where they have obtained these images, why these images were distributed in the entire Middle East - and exactly what the Danish Islamic Community were hoping to achieve - we must assume the images belong to Danish Islamic Community. The irony is that in doing so the Muslims have done exactly what they accuse the non-Muslims of doing: They have broken Muslim law by reproducing, publishing and distributing drawings of the prophet. And they have managed to out-blaspheme the infidel Danes by reproducing 3 blasphemous pictures that are far worse than anything ever published in JyllandsPosten. The imams have not yet explained on their homepage, http://www.wakf.com/, why they distributed these disgusting images - and what they were hoping to achieve. : soon finds out, however, that he isn't the only one looking for it!